What am I trying to do for kids? Pass on some of the traditions that my grand-parents and parents passed on to me. It’s an ongoing thing; I’m basically entertaining but teaching as I go about the music and about the instruments that I play. T&N: You mentioned you’re only doing the kids’ performances. 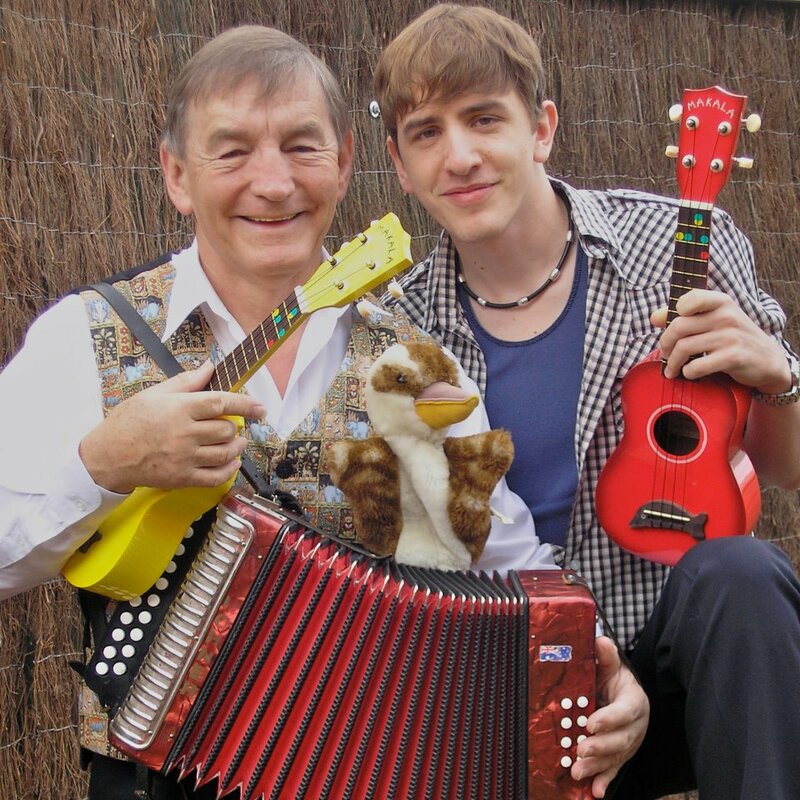 Do you find that sometimes when you’re somewhere else where you might have to do different things, do you have a bit of a mind-shift from doing kids’ songs like ‘Doctor Knickerbocker’ to ‘Songs for Grandma and Grandad’? Mike: Not really. I mean, I live on stage, so I look at my audience. I was once asked by “Monnie” Trapagga of Playschool [and Monica and the Moochers], how do you judge what your audience is going to do before you go on stage. I said, ‘What do you mean?’ and she said, ‘Well, I’ve to two tapes: how do I know which one to put on?’ I said, ‘I don’t; I just walk out on stage, look at the audience and start the song or the story. So, if I’m confronted by a group of senior citizens I play songs that fit that story – it’s not a mind-switch. I do have to work hard if I’m doing a specific show that features a specific instrument or poetry or something like that. I know I have to work hard on getting the material beforehand, but that’s part of the fun that keeps you original. Basically, an audience is an audience: the material changes; the attitude doesn’t. T&N: I’m mindful of the fact that Tom’s got a massage coming up; I do have another question for you, Mike, but I’ll come back to that. Tom, tell me a little bit about your background in performing. Tom: I’ve been with Dad since, well, since I was born, watching him and now as I’m getting older I’m performing with him. The way I’ve learnt is by following what Dad does and imitating it a bit but actually listening to the songs that he plays and it’s an almost intuitive to know what he does next but you never do because…. it’s like getting your whole iTunes library and putting it on “shuffle”, and then going, ‘Alright, I’m going to do this song now and that song now’ and it’s quite bizarre but it’s great training as a musician because you can play pretty well in any key. Tom: No, I play the ukulele. T&N: Sorry, I stand corrected. Tom: I play ukulele, and my classically trained instrument is the trombone, but ukulele is my main instrument because it’s something that I can use with vocals. T&N: Just tell me a little bit about the classical training. Tom: I’ve come through the school system and bands. I was in the conservatorium concert band playing trombone so I’ve had that (in Newcastle). So, I’ve had that classical training in trombone so I can read music, I can do all of that sort of thing, but where I can really use my musical ear is when I play my ukulele. T&N: OK, I think we’re done with you. I’ll let you get off to your massage, but can I just get a quick ‘father and son’ shot? Mike: It’s very interesting watching Tom grow musically because he has his own music then he has the music with me. And they’re two different creatures, two very different creatures, but it’s almost seamless when he does the changeover. Tom: It’s “Trad and Now”! Mike: It’s my mobile phone; it sings ‘The Transports’! Mike Jackson. T&N: Mike’s folk… I mean, Mike’s phone has just gone off to ‘The Transports’. Do you know what the song is? T&N: What’s the reaction here like? Mike: We’re doing workshops with the ukulele and I’ve discovered towards the end of my career an instrument that I can put into kids’ hands and actually have a five-year-old playing music for the first time. It’s astonishing to watch for both the parents and the kids themselves. The kids will almost make their hands bleed; they’ve got to make it work, got to make it work. It’s just beautiful, at the end of my career, to not just be enthusing kids about music but passing on how to physically play music is just a joy. T&N: The thing I really picked up at Gundagai when I saw your stall there is the word “accessible” just leapt out at me because you’ve got these ukuleles that you’re selling for $25. Mike: Yes, what we did was create a system of coloured dots, so all you’ve got to do is press a red dot for a C chord, two yellow dots for your F chord and G7 is two greens and a yellow. And every kid can manage that, so it’s lovely to be able to facilitate that learning. T&N: I’ve got many enduring memories of Gundagai but one of them was looking around Carberry Park and watching all these kids wandering around, clutching their little ukuleles with the dots! It was great! Mike: Yes, we’ve just done Book Three and I’m astonished just how well they’ve gone. I walked into a shop in Darlington in England and this bloke said, ‘Are you Mike Jackson?’ and I said, ‘Yeah,’ and he said, ‘I’ve got your ugly mug over there…..
And that’s where my article ends and I fear I never finished it and it probably did not actually make print.